IgG, Ig A and Ig M molecules all have the flexibility to form aggregates by crosslinking virus particles. Early work on aggregation is well reviewed by Svehag (1968), and there are later discussions by Steensgaard and Frich (1979), Jacobsen and Steensgaard (1979), Thompson and Jackson (1984) and Davies and Padlan (1990). A priori, the number of infectious units is reduced when virus is aggregated, and this can be achieved by any antibody which recognizes a virion epitope, be it intrinsically neutralizing or not (Fig. 9). There are more recent data on aggregation of polyomavirus (Oldstone et al. 1974), adenovirus (anti-fibre) (Wohlfart et al. 1985), FMDV (Baxt et al. 1984), poliovirus (Brioen et al. 1983, 1985a; Icenogle 1983; Thomas et al. 1985, 1986; Taniguchi and Urosawa 1987; Mosser et al. 1989), rhinovirus (Colonno et al. 1989), type A influenza virus (Armstrong and Dimmock 1992; Armstrong et al. 1990; Outlaw et al. 1990; Outlaw and Dimmock 1990) and La Crosse virus (Kingsford et al. 1991). Some of this discussed below and some in Sect. 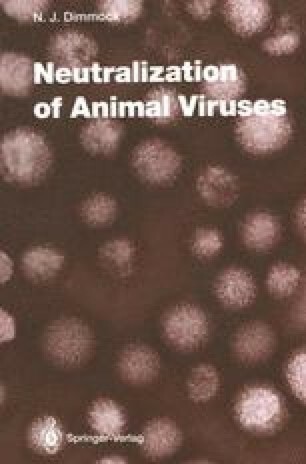 23, which deals specifically with neutralization of polioviruses and rhinoviruses.